DSWD Secretary Corazon Juliano Soliman administers the oath taking of Ms. Carmen Reyes Zubiaga as the new Acting Executive Director of the National Council on Disability Affairs. 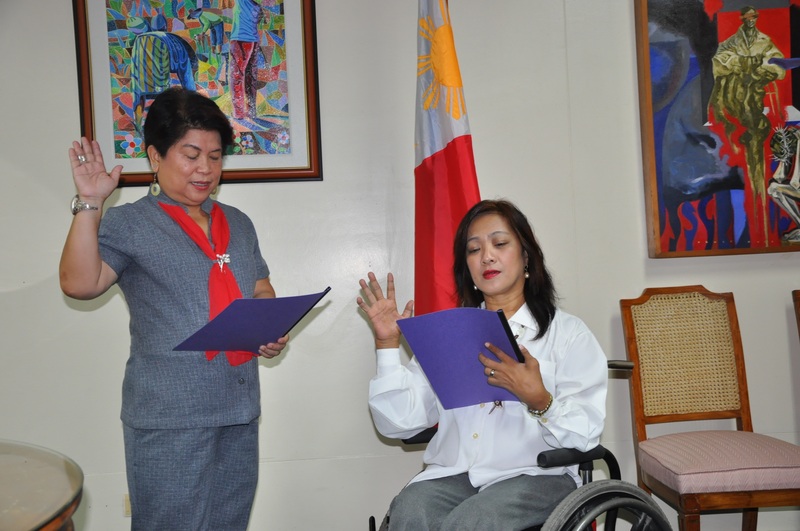 Ms. Carmen Reyes Zubiaga, a staunch advocate of persons with disabilities has recently been appointed as the new Acting Executive Director of the National Council on Disability Affairs (NCDA). Her track record in the field of disability started way back in 1987 as the Public Relations and Fund Raising Manager of Tahanang Walang Hagdananwhich lasted for nine years. She also served as International UN Volunteer, posted as Executive Director of the National Center of Disabled Persons under the Ministry of Social Affairs in Cambodia through the United Nations Development Program. As the founding president of Women With disabilities Leap to Social and Economic Progress (WOW Leap Inc.) she managed the development of the organization through income generating projects, developing training modules for advocacy, leadership and program development. Ms. Zubiaga was accelerated from 1st year high school to first year college through Philippine Educational Placement (PEPT). She earned a degree in Bachelor of Arts in Mass Communication from the Trinity College, now known asTrinity University of Asia in Quezon City, working her way through a degree in Master in Development Management from the Asian Institute of Management with scholarship from the Asian Development Bank Japan in 1993. Before her appointment to the National Council on Disability Affairs, she heads the Public Information Office, concentrating on disability affairs at the Municipal Government of Taytay, Rizal. Her experiences and capabilities will immensely aid the Council in advocating full and active participation of persons with disabilities. As tasked to lead an agency mandated to formulate policies, coordinate and monitor its implementation, Ms. Zubiaga’s thrust is to empower persons with disabilities to claim their rights, have a voice in every community and get their appropriate share of community resources. Congratulation madam, sana maimplement lahat ng layunin ng ncda sa tulong o ninyo at sana gabayan kayo lagi ng diyos para maisagawa ito ng maayos para sa kapakanan nating may kapansanan. magrequest po sana ako kung pwede na sana makaroon kami ng kahit maliit na office para sa mga pwd dito sa aming bayan,para makatulong ako sa katulad kong pwd. pwede o ba ninyong padalhan ng sulat ang aming mayor regarding sa aming kahilingan? Mayor Miguel Rivilla paniqui tarlac. Willing po akong maasign sa office kahit walang sahod,para lang makatulong sa kapwa ko pwd, para may malapitan sila at may mapagsabihan ng kanilang concern o problema. maraming salamat po. To Mr. Gerry Valdez, kindly send a formal letter regarding your request. Kindly please address it to HON. CARMEN REYES-ZUBIAGA, Executive Director, National Council on Disability Affairs and email it to council@ncda.gov.ph. Thank you. What is the most effective and efficient way of lodging a complaint against a doctor who did not give 20% discount, despite demand that we should avail of that benefit, on medical services availed by my brother who is a PWD (deaf)? He paid 3,200 of professional fees and it is so sad to know that some doctors out there plainly refuse to obey the law which they very well know. Congrats, Carmen. If you still remember me I attended the seminar in Taytay last March. Ako yung nasa electric wheelchair. May problem ako on work discrimination na gusto ko sana ilapit sa NCDA. Also, mag apply ako sa job sa NCDA item # PLO2-41. Baka pwede mo akong tulungan. More power, Carmen and God bless you sa lahat ng programa mo.